killa hearts you: Sample Saaaaaaleeee!!! i dunno about you... but i love clothes. even better? clothes on sale! 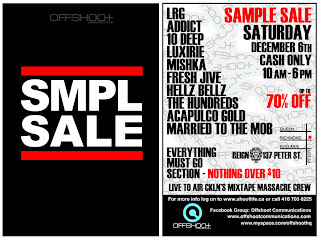 it's the holidays again and i wanna spoil myself AND the people around me... so why not ditch the mall and come out to the Offshoot sample sale. streetwear for up to 70% off? $10 section? Mixtape Massacre? do you REALLY NEED anymore reasons? oh yeah... i'll be there too... another good reason. cash is king, so leave your credit at home boys & girls!! !